We have been discussing matters related to student retention at my college. 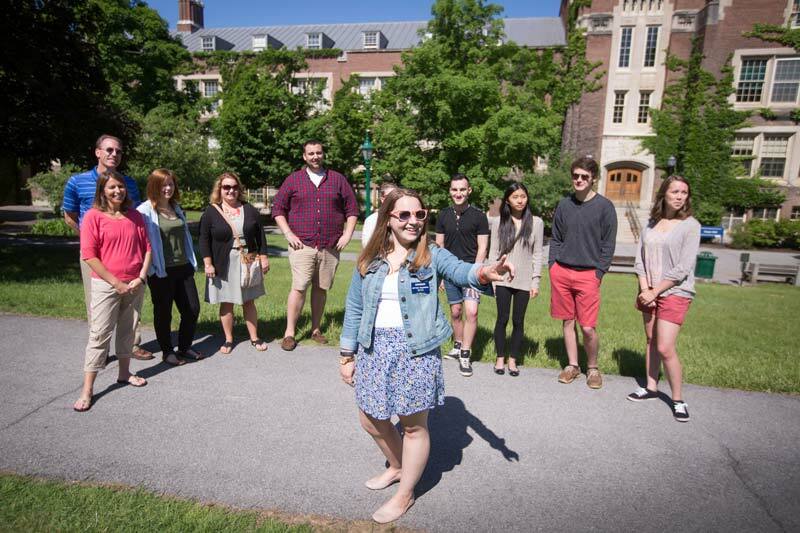 Only 85% of first year students return to Geneseo for their sophomore year. If we are losing three out of twenty freshmen, I suspect that what we have done in the past with great success may no longer be working. And given the sums of money we collect from students and their parents, I believe we have an ethical obligation to do better. We cannot put it all on the students without taking a long, hard, look in the mirror. The administration at my college has appointed a working group to study the problem of student retention. This group has already taken some sensible first steps, but I am not sure they are looking entirely in the right place. The challenge of student retention, I believe, must be met in the classroom. We need to change as our students have changed. Karen Moroski, who coordinates the Writing Center at Pennsylvania State University and teaches English there, tweeted to her “fellow profs” that they should “stop expecting the 20 yr. old writing tutors who work for me to teach the grammar, & formatting/citation rules that YOU yourself aren’t comfortable to teach/currently teach in your class.” She continued, “if you are gonna grade on it, teach it.” A lot of us do not do that. I have noticed a number of essays and books in recent months asserting that our students show the damage left in the wake of No Child Left Behind and its accompanying testing regime. They come to us with different sets of skills than previous generations and different deficiencies. NCLB, some of its critics point out, produces students who write less proficiently than earlier generations of students, who read less critically and less readily, and struggle on assignments where we ask them to combine creatively these important skill sets. We might justly view them as the products of a deeply flawed educational system. Perhaps it is not too dramatic to say that they are victims. I am willing to admit that my critique of No Child Left Behind may sound a bit hysterical. Still, I believe strongly that we must meet our students where they are, and that if we want to increase our rates of retention, we must reconsider what we are doing in our classes and why we do it, as Kevin Gannon has done in his fine recent article in The Chronicle of Higher Education. So let me begin with an assertion: the students we teach today are no worse or better than the students we have taught before. They are different. They are, indeed, more open-minded than students I have taught in the past, more tolerant, and more creative. They feel more powerfully their commitments to others, and at their best they are so bright, so articulate, so caring, and so smart that I find myself frequently awed by them, wishing that I had a fraction of their potential and their talent when I was their age. The laments I hear about our students, I believe, say as much about us as they do about the students we teach. I have played variations on this theme before. I have complained on this blog about those professors who post student bloopers and make fun of their students’ errors. I have questioned the entire enterprise behind giving grades. I have tried to convey something of the power and the beauty that I find in my students’ most thoughtful work. At my institution, as at colleges across the country, we are more than willing to accept our students’ money. Lots of it. And while I agree that higher education is not something that students purchase on a retail model, and that students are not, strictly speaking, customers, we cannot in good conscience ignore the reality that college attendance poses a significant financial hardship for many students and their families. And when I hear colleagues say that students are flunking their classes because they are just not up to the standards, or because they are “not ready for college,” or that these students do not have basic writings skills, and that this results in their receiving poor grades, I hear an abdication of responsibility to these students. If we admit them to our colleges, and accept the money that they pay for tuition, we have a responsibility to reassess our standards, and to consider how best to help students meet those standards. We need to think about what we want from our students, what they need to know in order to succeed. It may be that we might need to reconsider our standards. The kids we teach today may not be able to handle the same amount of work as students in the past. They may not be able to read as much as students we taught in the past. They might do better with assignments designed differently. My own experience is that we can confront these challenges with effective coaching, and that change is not necessarily declension. We need to be careful, when we complain about our students’ lack of preparation, or short attention spans, that we do not sound like cranky old people. Before I came to Geneseo I taught at an open-admissions college in Montana. We took anybody. Many of the students, unsurprisingly, struggled with writing, with balancing school with their work and family obligations, and with the sorts of basic academic skills that college success requires. So I made adjustments. I maintained higher standards than many of my colleagues, but I took the time to explain to the students why it was in their interest to try to meet these standards and I tried to offer the coaching and instruction necessary to get them there. I wish I had more time, but with 150 students a semester and no grading assistance, there was probably not enough of me to go around. At Geneseo, too, I have made changes. No more penalties for grammar and spelling. I now sit with the students who need the additional help, and encourage them to take what we have talked about to re-write their work. I long ago dispensed with in-class exams. I do not give quizzes because they strike me as punitive and coercive. I give out essay prompts. Not only do I arrive at a sense of what the students know and how they think, but I have no problems with plagiarism, which often arises as a problem when professors ask their students to answer unimaginative questions that have been answered a million times before. I understand that there are counter-arguments to all of this. Even these take-home assignments, when administered poorly, can become rote exercises where students regurgitate what has been said in class. Some might say that I am babying the students, and lowering my standards too much, and preparing them poorly for a “real world” where deadlines and writing skills and attention to detail and format matters. I understand that there are colleges with higher rates of retention that have neither made nor considered the sorts of changes I propose. Not all colleges are the same. Students will move through many worlds, all of them real, as they progress through life. They will adapt. My standards, I would argue, have been changed, not lowered. I am a teacher. I must be cognizant of who my students are and take into account what they bring with them to campus. I read a lot about teaching. I believe my colleagues and I would benefit by talking more often with teachers at the elementary and secondary level, because we would learn more about our students. I learn a lot by watching and listening to some of the very good teachers on my college campus. I am not suggesting that we all must make changes or that there is a right way to do things and that I have a monopoly on that knowledge. I have much to learn. But we all need to stay on our toes. We all need to rethink and reassess continually what we do and why we do it. We have little choice but to accept our students as they are, even if we might wish for something different, if we are to provide them with a powerful and meaningful educational experience.